Picture by watchsmart on flickr. 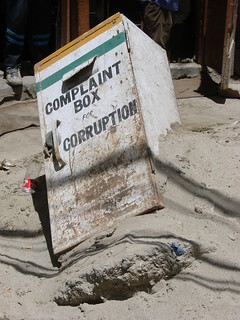 Corruption and Accountability: “Throwing the Bums Out” Does Not Work. Many theories of democracy stress the concept of accountability. Voters reward or punish elected ocials by extending or ending their political careers. Seeking the long-term reward of reelection, officials avoid the short-term benefits of corruption that would put them at risk of early electoral defeat. This good behavior, in turn, leads to voter loyalty and reelection. Previous studies of electoral volatility and political corruption, however, have not tested this reciprocal relationship with an appropriate empirical model. In this paper, we employ a bivariate normal model to assess the effects of malfeasance on voter loyalty and, conversely, of voter defection on subsequent malfeasance. We test these relationships on data drawn from 249 elections across 74 countries. Our results show that malfeasance does indeed provoke voter defection, but that electoral volatility is not followed by lower levels of perceived corruption. We discuss the importance of these novel results for the emerging literature on clarity of responsibility. According to the standard theory, voters hold elected ocials accountable for their performance in oce by voting out of office anyone suspected of corrupt behavior. This presumably purges government of the worst officials, reminds continuing representatives of the voters’ power, and signals to newly elected officials that they ought to behave more virtuously than their predecessors. The empirical evidence we have reported is reassuring of the standard model in only one respect. It clearly shows that voters respond appropriately to perceived corruption by throwing legislators out of office. Nevertheless, the observation that increasing volatility does not reduce perceived corruption undermines a central assumption of retrospective accountability theory: namely, that the replacement of corrupt officials creates a virtuous cycle where corruption and volatility are mutually reinforcing and spiral ever lower in tandem with one another. The absence of any impact of volatility on perceived corruption means either that legislators do not alter their behavior in the short run in response to the signal provided by vote volatility, or that politicians do respond, but their change in behavior is not immediately perceived by voters who continue to punish newly elected legislators for the sins of their predecessors. Distinguishing between these possibilities, empirically, requires data on actual legislative corruption, which is not available. Nevertheless, weighing the two scenarios, in our estimation the second seems more plausible. In our data set, voter perceptions of legislative corruption appear highly viscous in that they do not vary much over time. Corruption is covert and hard for voters to recognize. When they do perceive corruption, voters respond appropriately by throwing the bums out of oce. But because corruption is covert, it is equally dicult for voters to know if newly elected legislators are really better behaved or whether the corruption of new members simply has not yet been exposed. In the absence of visible evidence to the contrary, voters have no reason to update their perceptions and treat the new legislators any differently than the old ones. Rather than creating a virtuous cycle, this creates instead a low-level equilibrium trap. Voter perceptions of corruption give rise to higher levels of volatility, but because higher volatility has no systematic impact on subsequent perceptions of corruption, continuing perceptions of corruption are likely to sustain those higher levels of volatility, thereby threatening the re-election prospects of newly elected legislators regardless of their behavior. Our inability to find an effect of vote volatility on corruption by distinguishing quality democracies from low-grade ones (with an interaction with the country’s Polity score) lends support to the idea that the failure of punishment to alter (perceptions of) corruption is not limited to some subset of delegative, authoritarian, or otherwised adjective-laden set of democracies. Putting these findings in the broader context of the open government agenda, I can’t help but wonder about the limits of transparency in the absence of additional accountability mechanisms.